Comic books are often considered to be monopolized by America. Canada’s relatively unsung comic history creates an interesting space to investigate the cultural and social narratives that were relevant to the era. Bell Features and Publishing Company Limited began printing comic books in 1941 as a result of the War Exchange Conservations Act, which “restrict[ed] the importation of non-essential goods” (such as comic books) (Canadian Golden Age of Comics). This essay will analyze the “Dixon of the Mounted” stories in the sixth and eighth issues of Active Comics (1942). Throughout the comics, there are stark instances of racism, prejudice, and misrepresentation as well as complete lack of representation or acknowledgment of Indigenous culture. To refer to this lack of representation I will use the term “erasure”, or more specifically, Indigenous or cultural erasure. Through the examination of the comic’s appropriation, misrepresentation, and erasure of Indigenous culture, this essay intends to investigate the effects that these portrayals may have on the sociopolitical position of Indigenous people and culture. “Dixon of the Mounted” is a white male who is employed by the Royal Canadian Mounted Police and is stationed in the Hudson’s Bay area (Steele 5-6). In other words, he is portrayed as what would have been seen as the “ideal Canadian” male in the 1940’s (Beaty 434). In the sixth issue of the comic, he is chasing down three German Nazis. Dixon exhibits expert skills in canoeing, tracking and overall knowledge of wilderness, particularly in contrast to the Germans. It is important to note that Dixon is portrayed as exceedingly proficient in activities which are generally viewed as having a strong association to Canadian identity and moreover, that these activities historically originated from Indigenous culture and were taught to European settlers by Indigenous communities. Furthermore, it is also noted that there is no representation or acknowledgment of Indigenous people throughout the entire sixth issue. Subsequently, the portrayal of Indigenous people in Issue eight is criminalizing and demeaning, dealing with drug use; murder; and the inability of the Chief to maintain a safe and functioning community without the help of Dixon. This representation plays into harmful stereotypes, ultimately perpetuating an already disgraceful treatment of Indigenous people by European colonizers. It is equally essential to observe the strongly nationalistic tone that is displayed throughout the Dixon comics. 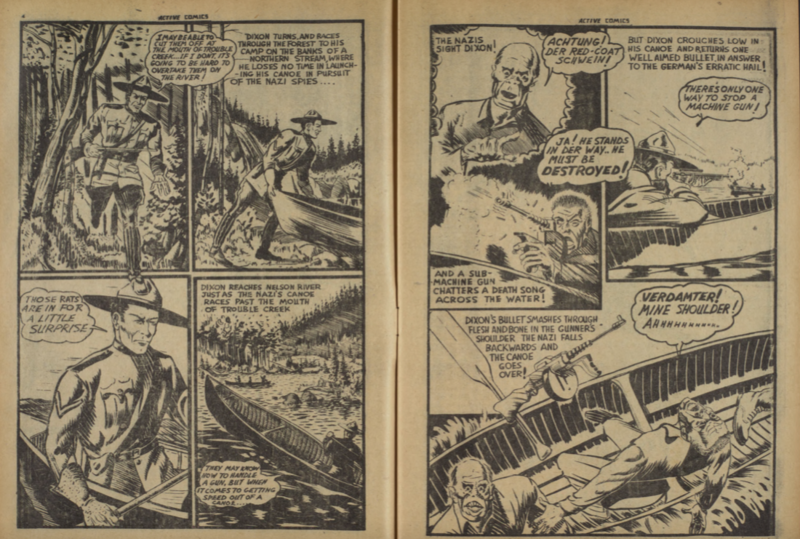 Canadian nationalist ideals represented throughout the comic include the glorified ability to navigate the wilderness and the portrayal that colonization is for the betterment of Canada (i.e. portrayal that Indigenous communities cannot function without assistance). As Beaty recognizes, there are often nationalist narratives in comics, and that this effectively “reduces Canada’s multicultural heritage and champions the . . . face of a heterosexual, middle-class, white, male government employee as the ultimate desire of the populace” (Beaty 434). 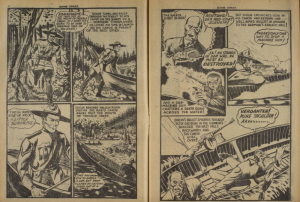 Dixon is represented in the comics as the Canadian ideal, which disregards the history of Indigenous and European interaction and exchange, omitting the cultural and historical significance of these Canadian ideals. As will be considered further throughout this paper, the ideals by which Dixon is represented are rooted in Indigenous culture, which is problematic due to the misrepresentation and erasure throughout the comic. Residential schools and “the 60’s scoop” are two examples of Canada’s extremely blatant attempts to completely eradicate Indigenous culture. The complete lack of Indigenous representation within the “Dixon of the Mounted” story in issue six is a much smaller, nonetheless still harmful, example of erasure. Cultural erasure is damaging because it discredits and disregards communities which are already marginalized, and works in favour of the dominant group. Such a dynamic distorts the history and representation of said marginalized culture, resulting in mistreatment of minority groups. It can be difficult to identify something that is not present in a piece of visual culture such as a comic book, but it is essential to consider the aspects of a narrative which are omitted and the effects this may have. Throughout the sixth issue, there is a noticeable lack of representation of Indigenous characters, this is representative of the attitude held towards Indigenous people at the time these comics were published. In order to obtain a more broad understanding, it is beneficial to focus on other instances of cultural erasure in popular Canadian art. Considerable Indigenous erasure is shown (or not shown) throughout many landscape paintings done by the famous Group of Seven (Jessup 146). Paintings done by the Group of Seven most often depict untouched Canadian wilderness and landscapes, giving the impression that there was no culture or community there, to begin with. This creates the perception that the Canadian wilderness is pristine and untouched, which in turn allows for European settlers to claim ownership of land which is, in actuality, stolen. Canada’s reputation as a white settler nation allows for the continuation of inequitable representation within institutions as well as the ongoing mistreatment of Indigenous communities by said institutions (Waldron). Jessup argues that the omission of Indigenous communities within these popular paintings proliferated the romanticization of pristine wilderness in Canada and eventually led to the relocation of Indigenous communities in order to portray untouched environments throughout Canadian National Parks for the enjoyment of tourists (Jessup 146-147). As discussed previously and will be discussed further, displacement is only one example of the consequences which have been the historical norm for Canada’s Indigenous people. Cultural erasure holds effects far beyond that of underrepresentation, it creates space for social and political mistreatment, as well as opportunity to misrepresent marginalized communities. “Black Tom”, Pg. 6-7. 1942. Active Comics No. 8. The negative representation of Indigenous characters in the Dixon story that is featured in the eighth issue is perpetuating the perception that Indigenous people are unable to sustain a functioning community without the assistance of white men (Steele 4). In a paper discussing comic book portrayals of Indigenous communities (specifically “Nelvana of the North”), Arnold argues that negatively representing and “dehumanizing” Indigenous people allows for them to be mistreated, and furthermore for their voices to be ignored and/or appropriated in regards to the formation of policies affecting the Canadian North (104-105). When a culture is portrayed as subordinate and problematic, it is more likely that their mistreatment will go unquestioned. Furthermore, this gives the impression that their voices and knowledge are less valuable than that of the oppressor, causing their input to be overlooked, undermined, or even stolen by others claiming it as their own. Canadian history illustrates this unfortunate reality through injustices such as the “60’s scoop” and over one hundred years of residential schools. 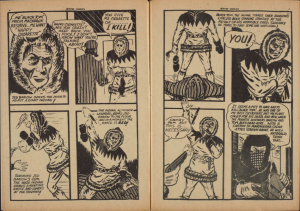 There has been ongoing unjust treatment of Indigenous communities in the seventy-six years since the “Dixon of the Mounted” comics were published. These injustices exemplify the importance of education and representation regarding cultural diversity and acceptance, which were clearly lacking in the 1940s. Furthermore, it demonstrates the importance of working towards equal representation within Canadian institutions in order to create equal opportunity. “When it Comes to Getting Speed Out of a Canoe…” Pg. 4-5. 1942. Active Comics No. 6. Dixon is portrayed as having exceptional canoeing skills throughout the story featured in issue six. As he chases down the three Germans in a canoe, Dixon says that the Germans “may know how to handle a gun, but when it comes to getting speed out of a canoe…”, at this moment the Germans begin shooting at Dixon and their canoe tips over, leaving them to swim to the riverbank (Steele 5-6). At first glance, this seems harmless enough as canoeing is a very well known Canadian activity, it makes sense that Dixon would be proficient. However, there is absolutely no mention of Indigenous culture throughout the comic or recognition that the canoe holds roots in Indigenous history (Benidickson). This lack of acknowledgment ignores the history of the canoe and is a subtle but relevant form of cultural appropriation exhibited throughout the comic. Liz Newberry notes that “the canoe often calls up a version of Canada that predominantly reflects the desires of a dominant, settler/invader society and thus calls up a Canada that may exclude Indigenous and broader immigrant communities and histories” (134). Here, it is recognized that there is a strong correlation to colonialism, appropriation, exclusion, and erasure when it comes to the relationship between Canada’s Indigenous people and European settler/invaders. It is problematic that Canadian nationalism has adopted so many Indigenous values and activities as main stakeholders of an identity that is seen as Eurocentric because the appropriation and subsequent erasure of Indigenous roots play a lead role in the subordination of Indigenous communities within Canada. This essay has focused on the erasure, appropriation, and misrepresentation of Indigenous culture in Canada and their role in the development of Canadian nationalist ideals. In order to grasp the seriousness of these actions, it is helpful to recognize the historical consequences. In a 1997 documentary entitled Forgotten Warriors, Indigenous veterans of WWII speak out about the treatment they faced after returning home from the war. Thousands of Indigenous people who served had voluntarily enlisted. One veteran named Al Thomas states: “When I came back from the war, they wouldn’t let us go curling, they wouldn’t let us go golfing . . . and when you went to the show, the Indians used to have to sit on one side of the picture show” (Forgotten Warriors 00:31:58). These veterans voluntarily went overseas to serve their duty to a country that undervalued and disrespected them, returning home to face racism, prejudice and segregation. Based on the previous analysis of the Canadian portrayal of Indigenous people, it is clear that these depictions were not harmless. Consequences were not only social but political, Indigenous communities were taken advantage of by the Canadian government. For example, in 1945, “the entire Montney reserve was taken through the soldier settlement act and sold to non-native war veterans”, the land that was taken was over eighteen thousand acres says Chief Gerry Attachie (Forgotten Warriors 00:27:11). Attachie states that they had been living there for five-to-six-hundred years previously. This corruption intensified when oil pools were found on the land, yielding five-hundred-million in royalties (Forgotten Warriors 00:27:43). After twenty years, a settlement was finally reached, the Blueberry river and Doig bands were compensated one-hundred-and-forty-seven-million dollars (Brunet). The settlement was a substantial amount, but nowhere near the actual value of the lost land. Instances such as Montney demonstrate the lack of regard for Indigenous communities that was held by Canadian government institutions. Bernelda Wheeler points out “the irony of Aboriginal soldiers fighting a war against the oppression of fascism, giving their lives for that, and coming home to face oppressive fascism” (Forgotten Warriors 00:31:38). This documentary illustrates the extent of the mistreatment and injustice that Indigenous people have faced throughout Canadian history, these injustices are only perpetuated by harmful misrepresentations, appropriation, and cultural erasure. In conclusion, the sixth and eighth issues of Active Comics and specifically, the story of “Dixon of the Mounted” exhibit largely problematic narratives of the relationship and perception of Indigenous communities and European settlers in the 1940s. Through the examination of Canadian popular culture, the exclusion, erasure, appropriation, and misrepresentation of Indigenous culture stands out. It becomes clear that there are ongoing issues of unequal power dynamics and underrepresentation of Indigenous communities within Canadian institutions. Realizing the ongoing injustices towards Indigenous communities within Canada, this essay recognizes the role that representation in popular culture plays in the treatment and acceptance of Indigenous people. An equitable relationship between Canada and it’s Indigenous communities will be achieved through greater representation of Indigenous people in media as well as within decision making roles, and creating equal opportunities for all Canadians, thereby creating a level power dynamic. Arnold, Samantha. “Nelvana of the North, Traditional Knowledge, and the Northern Dimension of Canadian Foreign Policy.” Canadian Foreign Policy Journal, vol. 14, no. 2, Taylor & Francis Group, Jan. 2008, pp. 95–107. doi:10.1080/11926422.2008.9673465. Beaty, Bart. “The Fighting Civil Servant: Making Sense of the Canadian Superhero.” American Review of Canadian Studies, vol. 36, no. 3, Taylor & Francis Group, Oct. 2006, pp. 427–39. doi:10.1080/02722010609481401. Benidickson, Jamie. “Canoeing”. The Oxford Companion to Canadian History, Oxford University Press, 2004. www.oxfordreference.com.ezproxy.lib.ryerson.ca, http://www.oxfordreference.com/view/10.1093/acref/9780195415599.001.0001/acref-9780195415599-e-286. Brunet, Robin. “Be Careful What You Wish for: Two Northern Indian Bands Are Awarded $147m in Mineral Claims [Doig River & Blueberry River Indian Bands].” British Columbia Report; Vancouver, vol. 9, no. 30, Mar. 1998, p. 28. Canadian Golden Age of Comics, 1941-1946 – Comic Books in English Canada Beyond The Funnies.https://www.collectionscanada.gc.ca/comics/027002-8300-e.html. Newbery, Liz. “Paddling the Nation: Canadian Becoming and Becoming Canadian in and through the Canoe.” TOPIA: Canadian Journal of Cultural Studies, vol. 29, no. 29, Topia, 2013, pp. 133–62. doi:10.3138/topia.29.133. Steele, T.A. “Dixon of the Mounted”. Active Comics, no.6, Bell Features and Publishing Company Limited, July 1942, pp. 1-10. Canadian Whites Comic Book Collection, 1941-1946. RULA Archives and Special Collections, Ryerson University, Toronto, Canada. Steele, T.A. “Dixon of the Mounted”. Active Comics, no.8, Bell Features and Publishing Company Limited, September 1942, pp. 1-9. Canadian Whites Comic Book Collection, 1941-1946. RULA Archives and Special Collections, Ryerson University, Toronto, Canada. Todd, Loretta, director. Forgotten Warriors. Www.nfb.ca, National Film Board of Canada, 1997, www.nfb.ca/film/forgotten_warriors/. Waldron, Ingrid. There is Something in the Water, Fernwood Publishing, 2018. pp. 37-52.